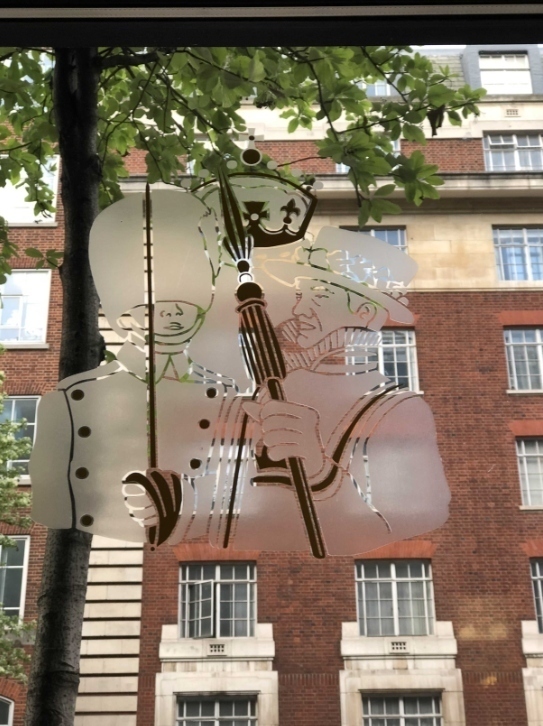 If you've ever wandered down Woburn Place towards Russell Square, you may have found yourself looking on with some degree of curiosity or bemusement at a place whose sign features a Beefeater, a tube station sign, the Houses of Parliament, a red bus and a household cavalryman on the signage. 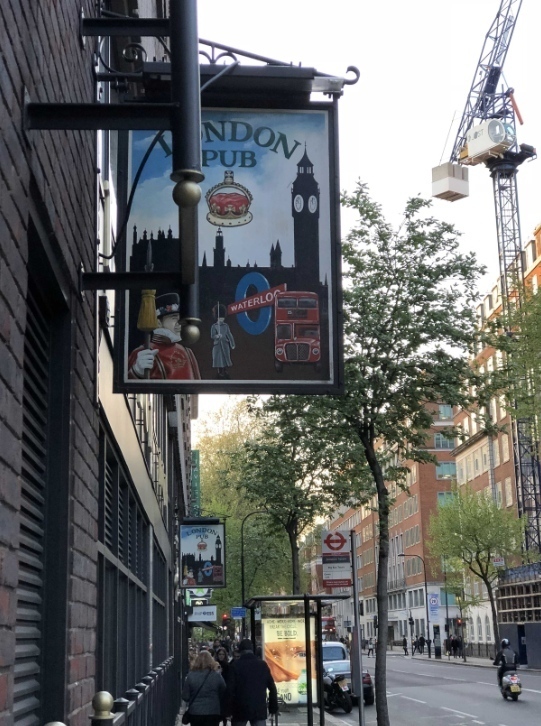 It is The London Pub. 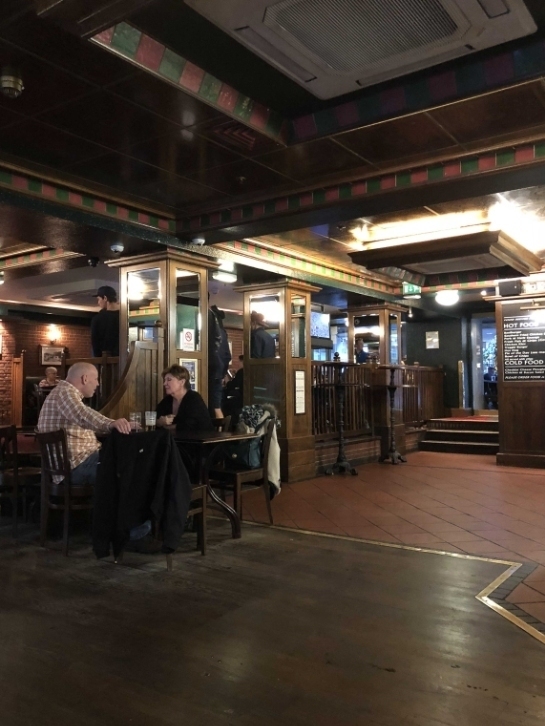 The London Pub is a flat dark grey industrial space, tainted by the aroma of chlorine. And, as you walk by, you may ask yourself: "Is it a tourist trap? Who really goes here? Is it really a pub at all?" You are not alone. Wondering all of these things, we decide to find out for ourselves. So determined are we, in fact, that we have to go twice. Our first attempt on a Saturday afternoon fails quite badly. 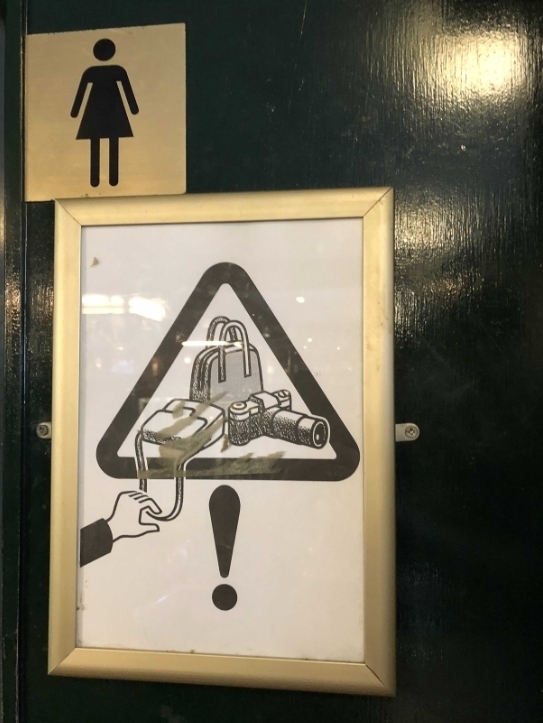 All we find is a bunch of very English people drinking out back in the lukewarm April sunshine, and a Spanish speaking couple deterred by a hastily printed 'CASH ONLY' sign blu-tacked to the entrance. We decide to return on a Thursday night, which at 6.15pm, is far more lively. The sign is gone — let's see what our card money will get us. To the bar we go. 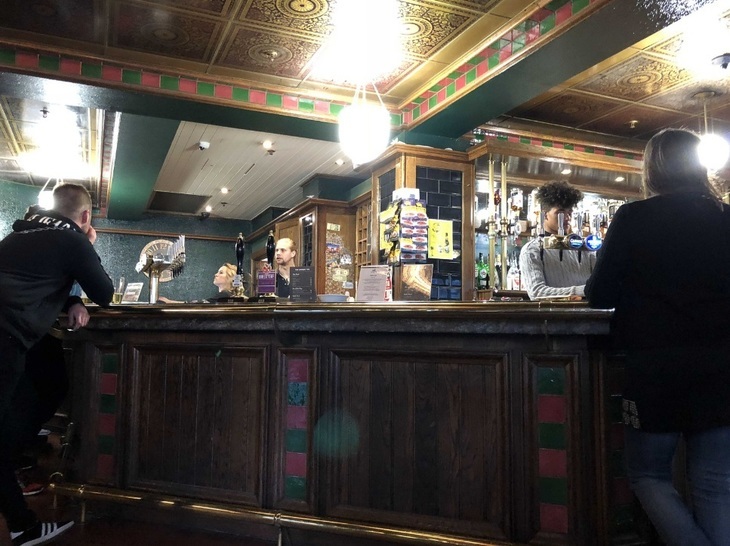 On first reflections, this is a perfectly normal pub/bar, but with one exception: there is a large, bilingual food menu — something you won't see in many boozers around here. 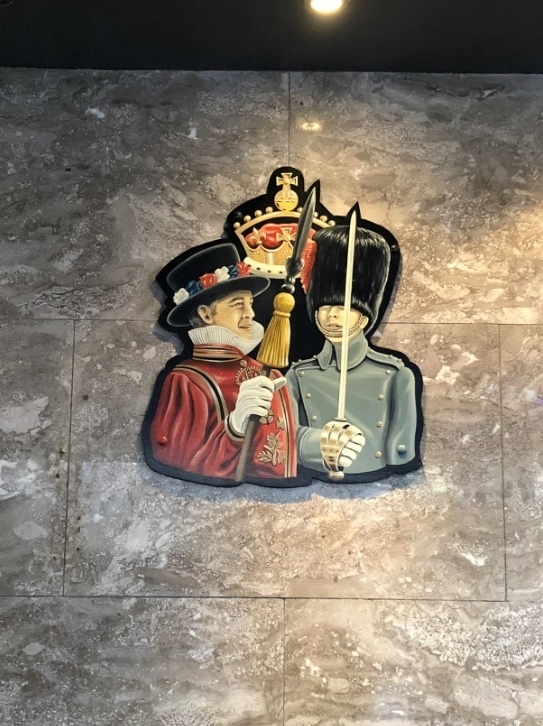 We were expecting an interior full of pictures of Big Ben, the Queen's Guard and The London Eye, but, the décor isn’t as abrasive as you may expect, judging from the outside. 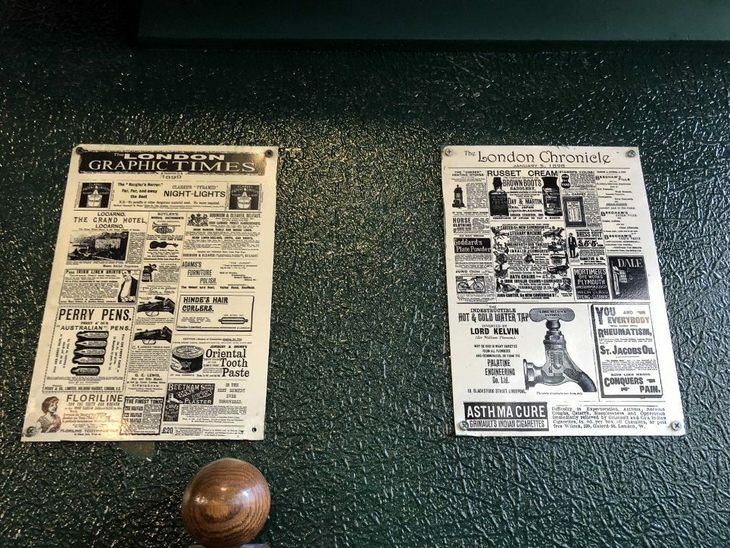 There are old excerpts from old, old newspapers — such as the frontpage of The London Chronicle from 1898. And lots of reminders not to leave your bag unattended. 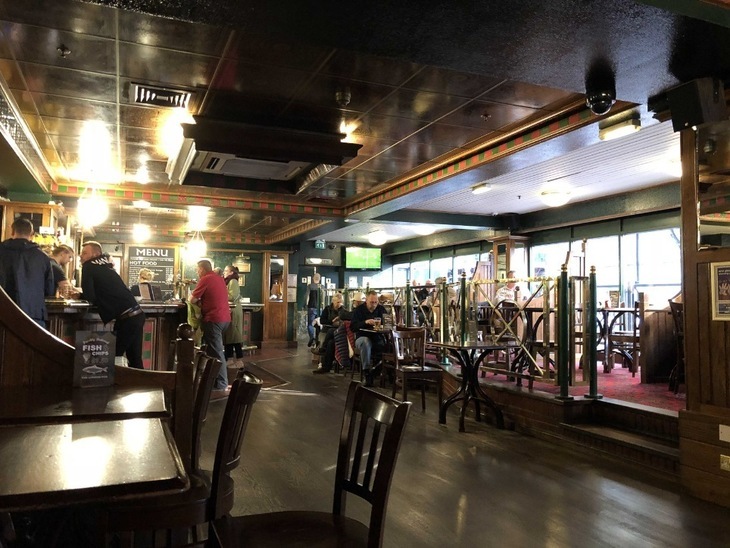 It's got an air of sports bar or Wetherspoons about it (think 'converted industrial space with some pub furnishings'). There are TVs everywhere — each of them appearing to display a different football match (or perhaps the same match on different channels… we're not sure). The mood is set (if you could say that) by an endless stream of background noise that moves back and forth between pop and EDM. It's at a volume quiet enough to hold a conversation but loud enough that you can't ignore it. And the pub's staff? Bohemian. All have hairstyles of varying unconventionality and length. One guy looks like Guile from Street Fighter forgot his hairspray (and changed his skin colour). One may or may not have played bass for Amon Amarth. The other sports some — can we say 'Satanesque'? — facial hair and a fedora. Since this is meant to be a pub, we shall have a beer. Some familiar brands are on draft, but there's a notable absence of craft. 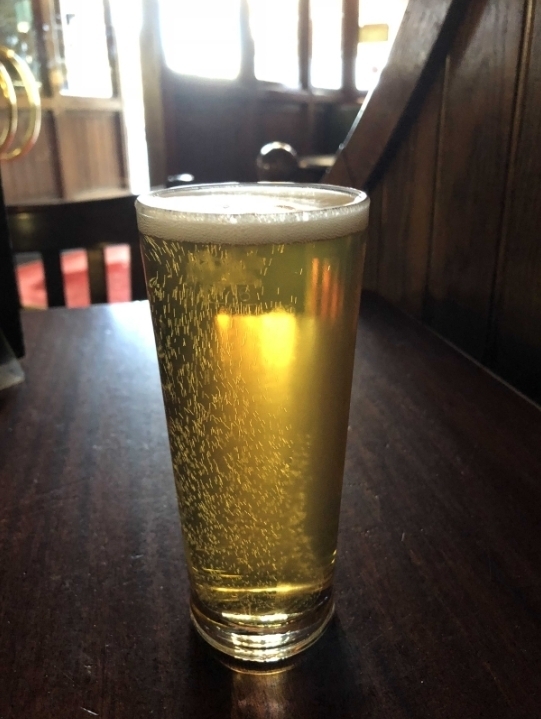 We go for a half pint of Portobello's London Pilsner and begin the human safari. And begin it does, immediately. Our order is met with some amusement and an East End punter asking 'a half, what's a half?' 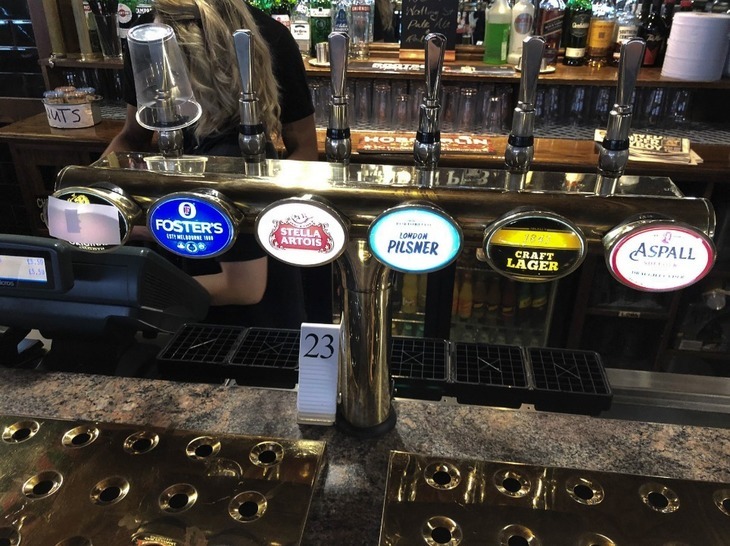 He orders a proper pint for himself, and three more (we hope for his friends). It's about this point that our spidey sense for 'confused foreign visitors' is triggered. Namely for a couple standing beside us at the bar, who we think are Japanese. As their eyes appear to move nervously between the drinks menu and the pub's license and legal info, we attempt to strike up a conversation. This goes exactly nowhere. We're not sure if it's the trauma of trying to order beer off of a license menu, or if they have taken offence to our bedraggled 'afterwork' look. Or maybe it's that fabled Japanese politeness, taken to its infinite degree of 'too polite to talk to anyone'. Oh well, there's always more multicultural fish in the sea. Of course, we say that, but much of the clientele is like your local. Men with faded arm tattoos in paint stained work trousers and polo shirts. Others with strong East End accents, closely shaven hair and puffer jackets. Guys in Armani hoodies wearing skinny black jeans and shiny Lacoste trainers who may have used a touch too much hair gel. 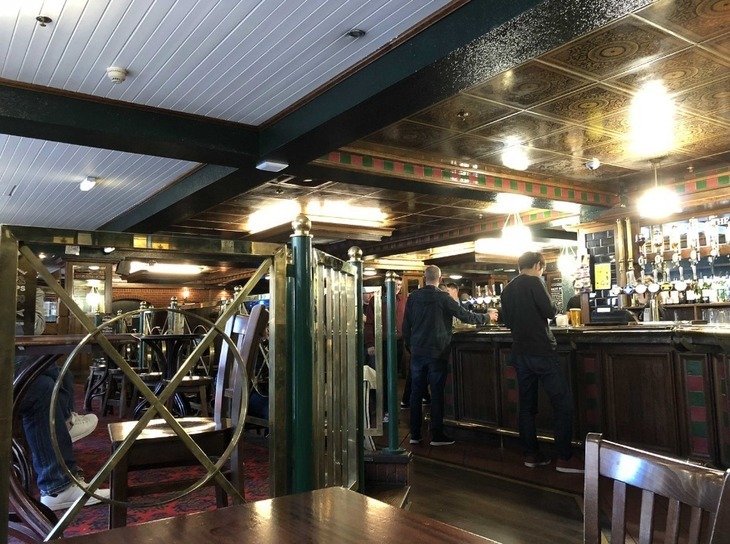 And of course, the solitary old men in flat caps who wear coats indoors, nursing a pint and working their way through the sports pages. Why are they here? Do they not know that they drink in a naked parody of an English pub? You can often spot the tourists from a distance. They're the ones who've brought their kids, and have stuffed plastic water bottles into the cargo pockets of their shorts. Attempts to strike up conversation with a French lady and her daughter result in an apologetic "no English" and lingering sense of disappointment that we didn't try harder during GCSE language lessons. We must stop failing. And we must continue our research. Is there a beer garden? Outside we go, finding something that is more of a smoking area with picnic benches than a beer garden. There are lots of tiny holes in the rain canopy and for that reason, some of the seats are slightly soggy. An Australian and a Scottish man discuss what appears to be the recruitment business and experience with 'weird contracts'. One wears a suit, one wears what looks like a Christmas jumper with none of the colour. The Scotsman excuses himself to go to the gents and we never see him return. There's another pair of men with English accents — one with a tall black beanie hat worn in a way that resembles a small, black cotton version of Marge Simpson's hair. As they ask questions of each other such as 'what do you do for a living? ', we conclude that they are possibly on a date. 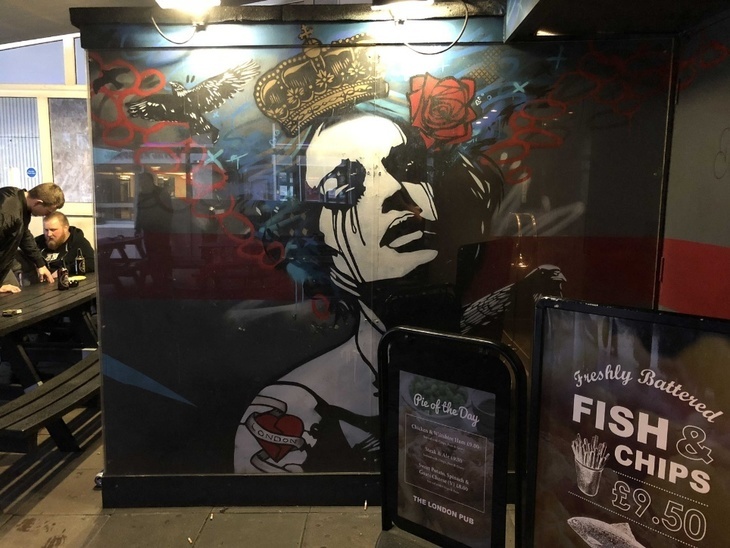 There are two murals out here, one of a colourful woman who we can't recognise, and another, smaller, mural adjacent, styled like a heart tattoo. Both artworks are covered in a plastic screen to prevent 'editing'. Beside the murals, a small group of hooded Eastern European men huddle conspiratorially, vaping furiously. The tobacco mist emanating from under their hoods is more than a little demonic. Reminding us of the Nazgul, we won't be trying to start a conversation with them. 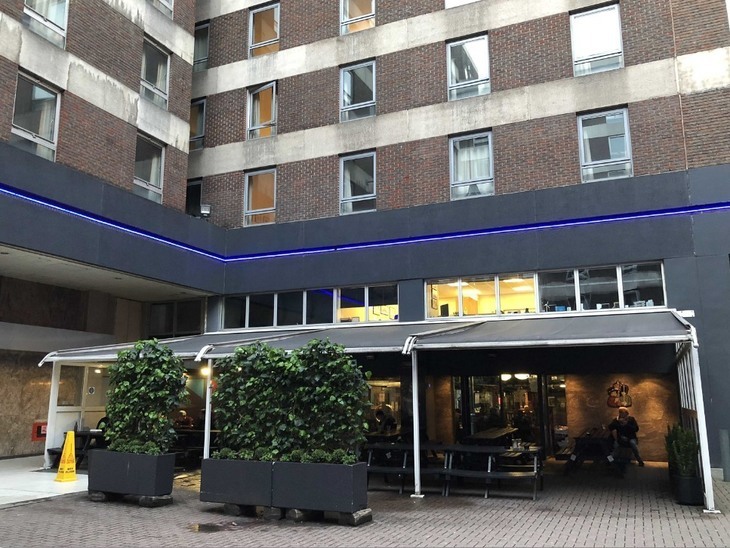 The venue and its accompanying smoking area are enclosed within the courtyard of the Royal National Hotel. 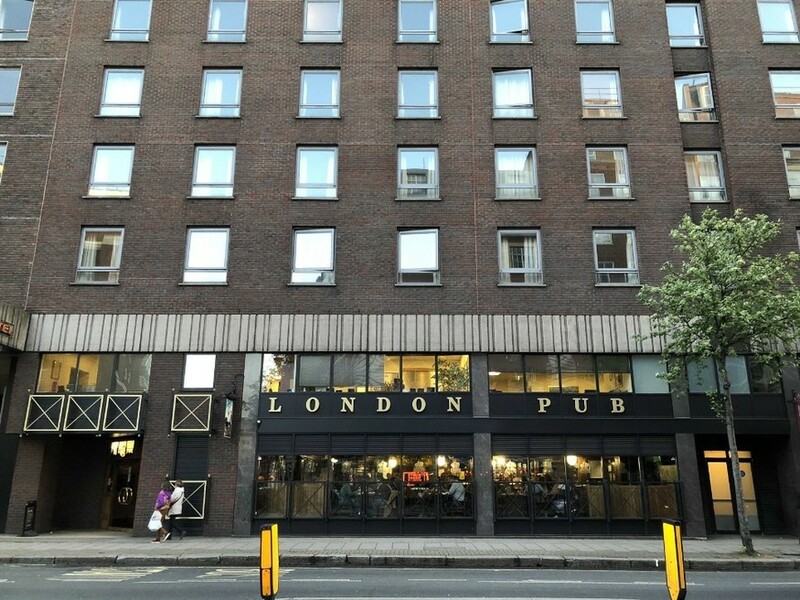 In this context you can see how small The London Pub is. Not exactly intimate, but not the sprawling tourist trap we may have expected either. It's also a staging area for the hotel — a large white coach sits here for half an hour with its cargo doors open, luggage unattended. We come back outside later and the Nazgul have been replaced by a small group of merry, noisy Yorkshire metalheads, smoking in the old fashioned style. The Lord Of The Rings references continue, as one of them refers to himself as 'Ginger Gimli' (an astute self observation based on his build and facial hair). Back into the pub itself, which is starting to fill up. What are people eating? Fish and chips seem popular — but at £9 something a pop, it doesn't compare favourably with our local chippy. We decide to go to the bar and see what's happening. 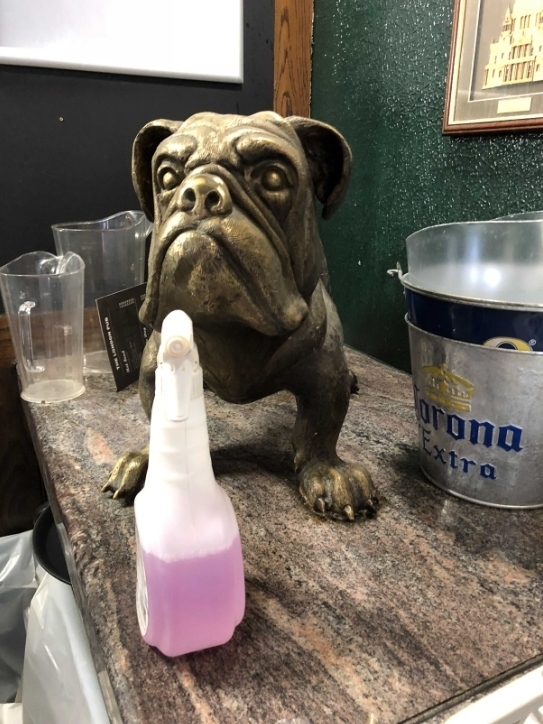 An older Hispanic accented lady appears to be asking the bartender when the bar is at its busiest — so that she can come back and fully experience it (…what?). She translates on the fly to an older man wearing a baseball cap and a kind of infinitely fatigued look. Immediately after, an impossibly young looking Asian guy with a extremely strong Chinese accent tries to buy a draft beer and is politely sent back to bring his ID. A little later, a bartender explains to another old chap in a baseball cap how our currency works (the outstanding figure is £2.50). The man appears to have overpaid but doesn't understand that the bartender's actually trying to give him his money back. This goes back and forth for a painful prolonged period before, after some reluctance, he allows the bartender to give him his change. Speaking of money, it's time to splash out on pie. We decide to opt for steak and ale. 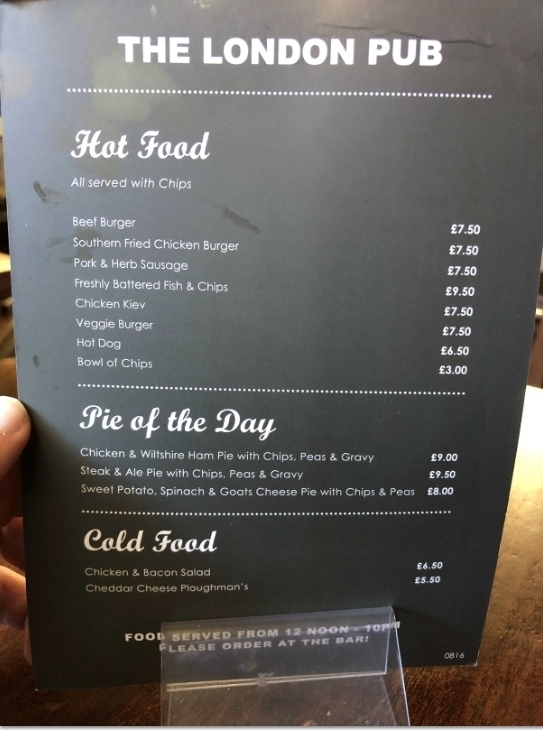 As this is on a menu that looks like it doesn't change that often, and there's more than one option, we question if this is really the 'pie of the day'. Maybe 'pies of the month' would be a better description. Said pie arrives suspiciously quickly. 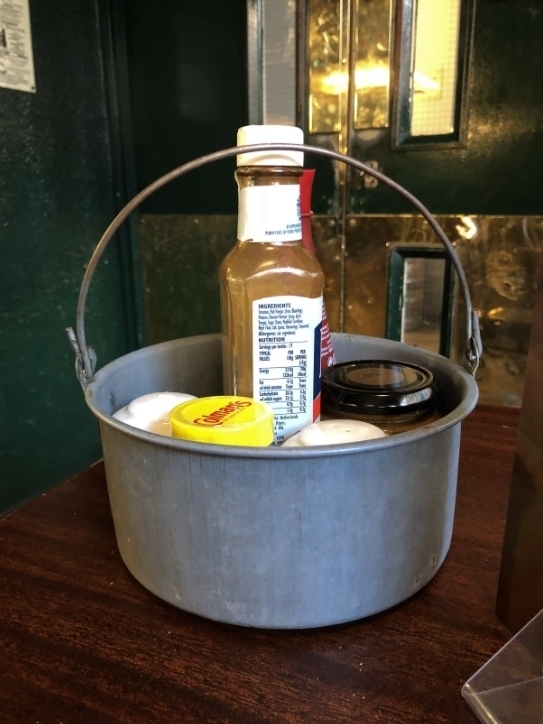 In terms of service, they bring the food to you, but you have to go and get your cutlery and a metal bucket that contains your condiments (which includes HP Sauce and Sarson's, obviously). The gravy is good (tasting strongly of thyme) — and reminds us of a well known (instant) brand that we all know. The pie is generous with the meat — and the sauce is thick and hearty. The chips are a strong 5/10 — cooked enough to be dry, but not enough to be crispy or crunchy. The peas, meanwhile, are overcooked to an olive green colour. That said, there's always the argument that we traditionally boil our vegetables to death in this country and so perhaps this is the authentic way to serve them. 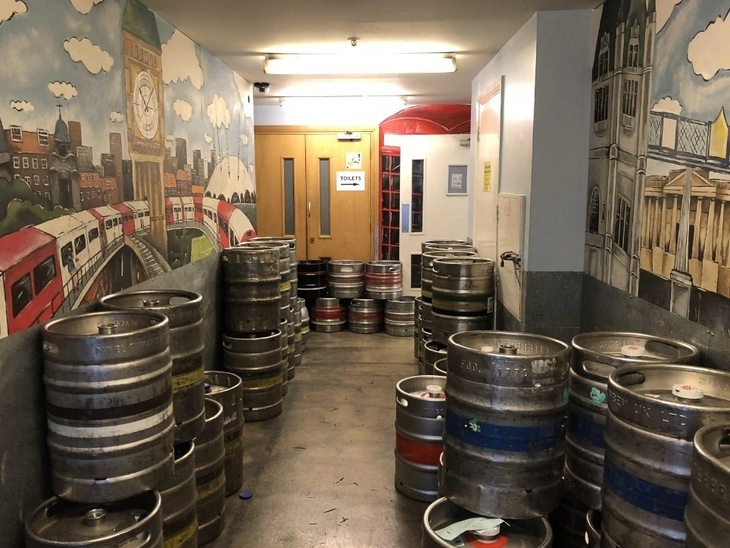 The gents are accessed through a veritable grotto of spent beer kegs (a cheeky feel confirms this). 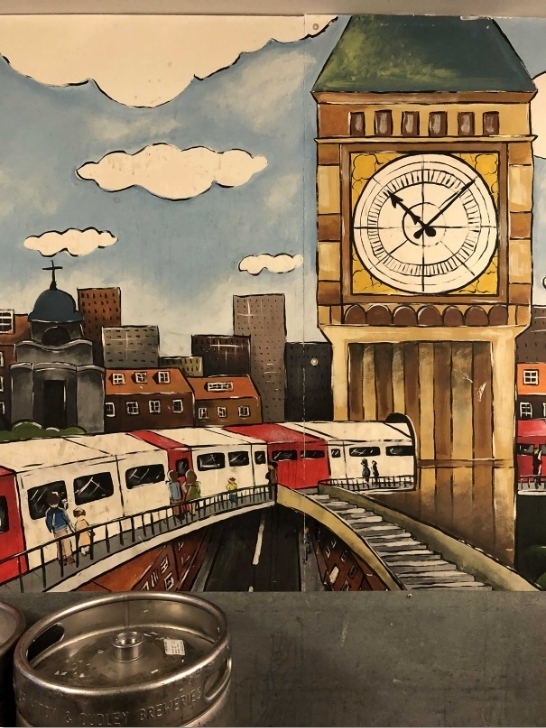 There's a mural on the wall, but unfortunately someone has taken the liberty of scribbling on it. Within the gents you find only urinals, a fact that visibly perplexes a fashionable Asian 20-something who goes in and out of the loo no less than four times. Back at the bar proper, things are heating up. At 7.45pm the transformation sports pub is complete, thumping EDM giving way to the sound of an exacerbated crowd and a scouse man giving mostly unintelligible commentary. We are now sat beside a couple who we think are Italian. Despite being Italian, they seem unfamiliar with football crowd psychology and visibly flinch, when someone scores and the volume rises drastically. 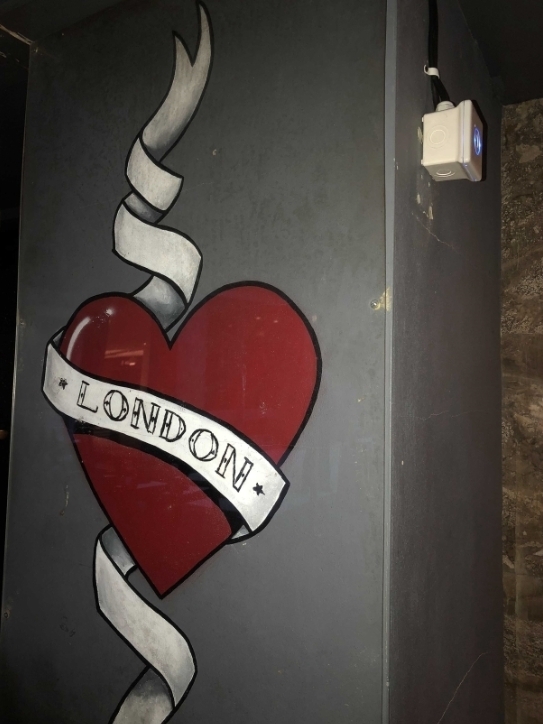 You could argue that The London Pub is basically a sports bar but with some touristy trappings (namely the pricing, signage/décor and food choices). 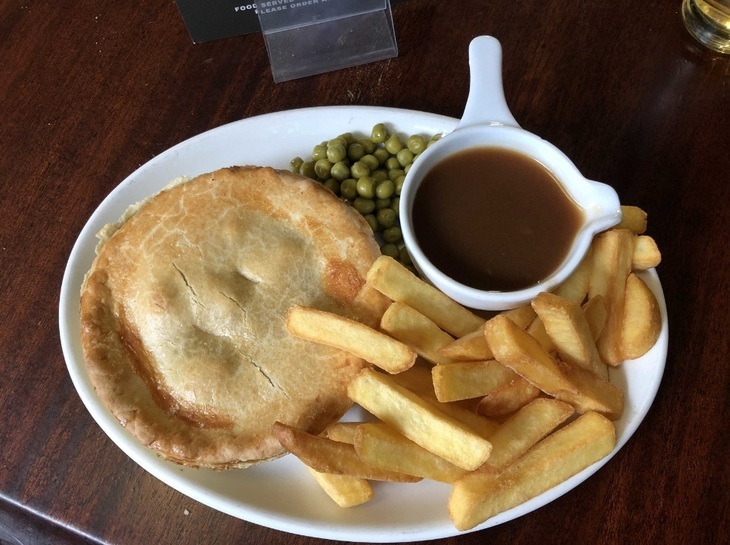 Unlike a good number of its competitors, it doesn't really care for continental cuisine, nor does it make even the slightest attempt to be 'gastro'. Yes, it feels a bit plastic, tourists could probably find worse places around Piccadilly Circus. And there's a lot of native Londoners drinking here, which has got to count for something. 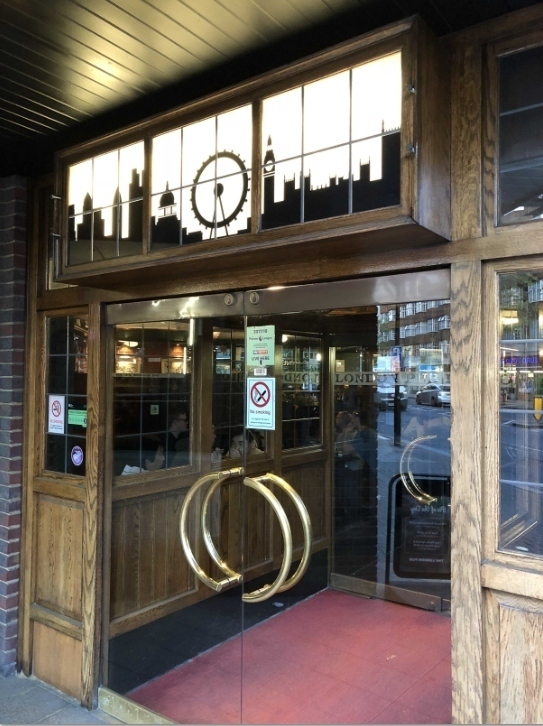 If this was the first pub we visited on an international trip to London, we'd be impressed with the bilingual menus and disappointed with almost everything else. But maybe not quite enough to flee the country.